personalized design – Design Your Lifestyle. September 2016 September 2016 Peter Salerno, Inc.
Fall is a season of change. As the leaves turn to brilliant shades of red and yellow, daylight hours shift, and summer wardrobes make way for sweaters and pullovers, home design trends also begin to shift towards future trends. Kitchen design often leads the way in home design trends, and rightfully so. The kitchen is the heart of your home, where family and friends gather to share meals, drinks, stories and life’s everyday moments. As such, it’s important your kitchen design fully reflect your sense of personal style, with design elements that tastefully bridge the divide between the classic and the contemporary. There will always be new kitchen design trends with which to experiment, but one facet of your kitchen should always remain timeless – your cabinets. While statements are often made with backsplashes, accessories and countertops, your kitchen cabinets are often the “glue” that holds your kitchen design together. So which kitchen cabinet design trends should you trust? Which can you embrace as an element of your holistic kitchen design for years to come? As passing trends fall out of vogue, these Fall 2016 kitchen cabinet design trends will stand the test of time. Consider them as a wise investment for your kitchen design or re-design project this fall. 1. Gray and White Cabinets are Always “In”. At first, one may typify a gray or white cabinetry scheme as staid or prosaic. In actuality, the right cabinet maker and kitchen designer will make white and gray cabinetry a clean, stunning focal point in your kitchen design. Experts from HGTV to the NKBA laud the use of white and gray cabinetry, rewarding their use in design with some of their highest 2016 awards and honors. 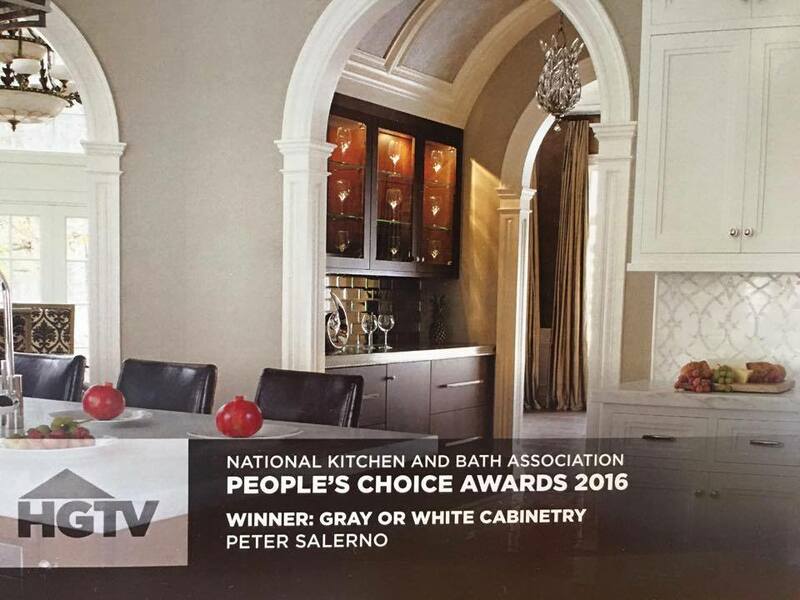 Peter Salerno Inc. (the most award-winning kitchen and bath design firm in North America since 2002) used gray and white cabinetry to earn a prestigious HGTV People’s Choice Award during the 2016 KBIS Convention. When installing new cabinets in your home kitchen, bear in mind you want them to last for a long time. With that in mind, Peter Salerno suggests adding personal modifications to your cabinet design. In Peter’s own home kitchen, his cabinets are adorned with hand-painted flowers, each of which represents the birth month of his family members. As a result, Peter is reminded of his loved ones every time he enters his home kitchen space. He also reaps the benefit of owning world-class cabinetry decorated by beautiful rustic floral artwork! 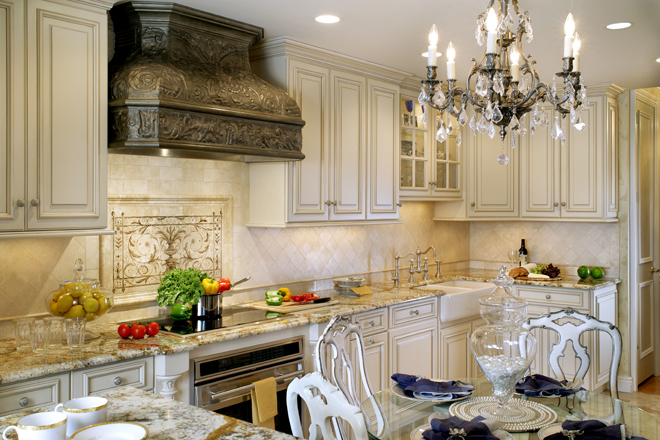 How can you add a personalized touch to your kitchen cabinetry? Choose a color scheme, decorative pattern or other detail that marks your kitchen space as your very own. It’s a subtle yet intimate way to create a one-of-a-kind kitchen design. Another fantastic Fall 2016 kitchen cabinet design trend is the implementation of custom carvings in and around your cabinetry. 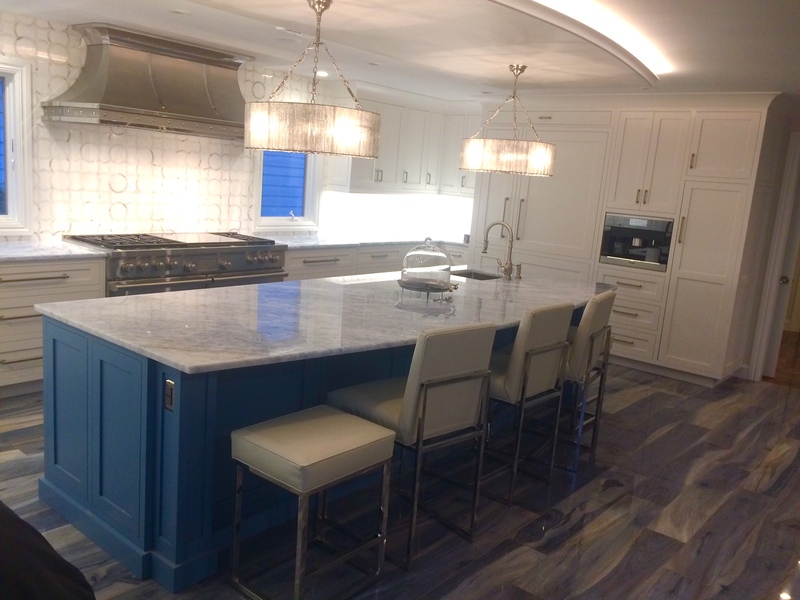 While the intricate woodwork likely requires hiring a master craftsman like those at Peter Salerno Inc. (see the video below), the end result is a gorgeous facet of your kitchen design that will never be duplicated. Be creative when deciding how to use custom carvings in your cabinet design! Will they be used as cabinet handles? Will they outline the cabinets themselves? Or will you hire a custom master cabinet craftsman to design custom carved crown moulding above your high cabinets? Whatever kitchen cabinet design trend you embrace, make sure it properly blends fresh ideas with classic design elements. With that balance in mind, your Fall 2016 kitchen cabinet design (or re-design) will be a lasting, cherished focal point of your home kitchen for years to come. For expert advice on your home kitchen and/or kitchen cabinet design project, please fill out the contact form below.